Easily create or arrange your own music. Produce accurate, customized sheet music, and create music that sounds great. Listen to the song while you follow the notes on your screen. Then edit the notation and the sound of the music. 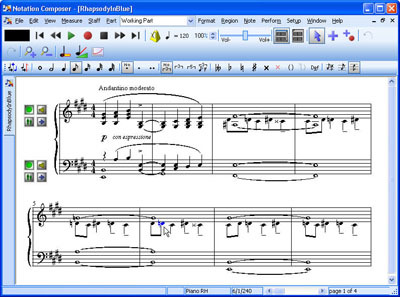 Find music on the internet, and arrange it to suit your tastes and skills.You can use Notation Composer to arrange music to fit your own personal musical style. Have serious fun making music with Notation Composer. Pentium 350Mhz or faster; 512Mb memory; soundcard. ...... Transpose the music to suit your instrument or voice range. Prepare fake book lead sheets for guitar or keyboard. After creating your music with Notation Composer, let the software provide the accompaniment as you play or sing along, or set up practice loops to perfect your performance. Perform Wave to Midi conversion. Qweas is providing links to Notation Composer 2.6 as a courtesy, and makes no representations regarding Notation Composer or any other applications or any information related thereto. Any questions, complaints or claims regarding this application Notation Composer 2.6 must be directed to the appropriate software vendor. You may click the publisher link of Notation Composer on the top of this page to get more details about the vendor.